Notre Dame landed a big-time commitment from 2020 De Smet (Mo.) receiver Jordan Johnson‍ on Saturday evening, which was a surprise as he had set a commitment date in July. The four-star prospect and his whole family made the trip to South Bend and it led to Johnson feeling comfortable to make his decision. Notre Dame’s staff was fired up when they got the news, but so was 2020 Notre Dame quarterback commit Drew Pyne, who put in a ton of time building a relationship with Johnson over the past year. Johnson had always had Notre Dame high on his list and the combination of life on and off the field put the Irish over the top. While on his official visit, Johnson was able to familiarize himself with his future school and learn more about the program. One of the highlights was taking in Saturday’s practice inside Notre Dame Stadium. Johnson was able to see receivers coach Del Alexander coach his guys and see how the players responded to his coaching. Johnson will now turn his attention to recruiting for Notre Dame. 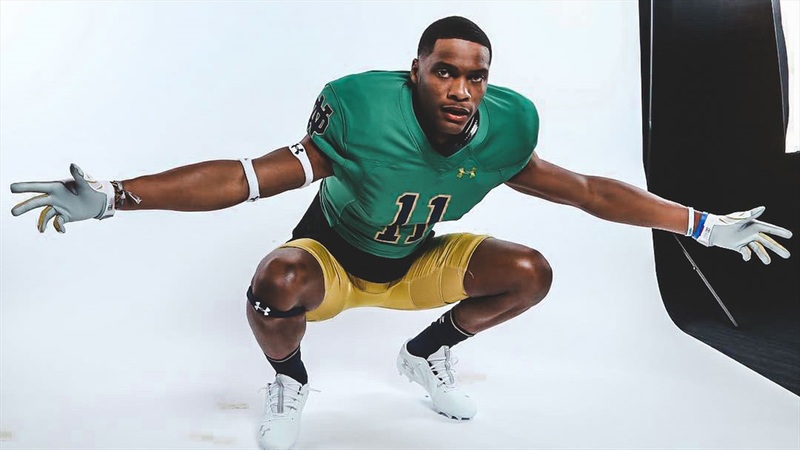 He’s done with official visits and has his eye on another top receiver to join him in South Bend.